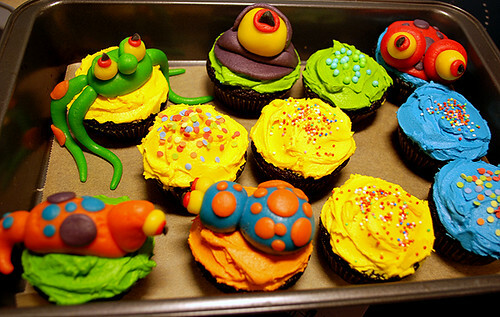 Flickr user corrosiveheart made these adorable monster cupcakes for a boy's birthday party. You can see all her other from-scratch baking (a lot of cupcakes, but some other stuff as well) on this photoset. Wow, the frosting colors are gorgeous there. 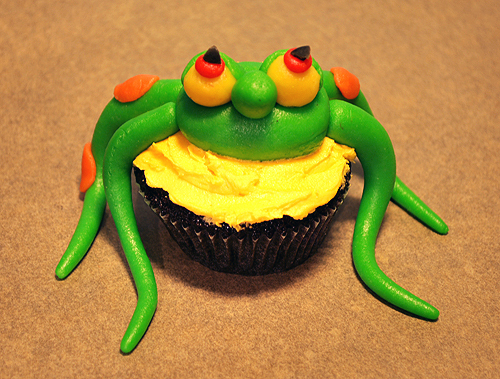 So glad we're starting to see Halloween cupcakes! They appear to be spookily delicious! Awww thankyou guys for posting about my stuff for the third time! (Blushes) Your blog is one of the reasons for why I've recently become obsessed with cupcakes and all things cupcake-related. I just wanted to post that these were a HUGE hit today! I baked these for my friend's son and all the kids loved them! 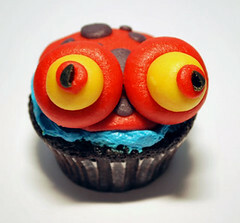 The monstercakes (marzipan monsters) went down especially well because every child in Norway loves their marzipan!